There are so many advantages to owning a home. But, there are also many things to consider before you buy. Your credit score, how much do you need for a down payment, how much can you borrow, are there any hidden costs, are there tax benefits, should you prequalify...and so much more. It can seem daunting. At Providence Bank, we work with people just like you to help them through the home buying process. Our highly skilled team of mortgage bankers help everyone from first-time home buyers to people who've bought and sold for years. Why do our customers look to us for help with this important purchase? It's because we know the local market and carefully help you choose the perfect mortgage. Whether you're buying a new home, building or refinancing, we will guide you through the process, explain your options and make sure you get the best financing available. We all hear so much about credit scores. What does that mean to you? We'll help you sort out how to qualify for a loan that makes sense if you have perfect credit, less than perfect credit, or don't have a huge down payment. Our bankers have more ways to say Yes! We offer low closing costs, quick credit decisions and flexible payment options. 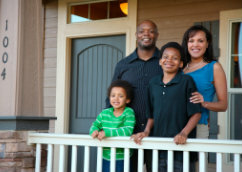 We have a variety of loans to fit your specific needs including Conventional Loans, FHA, VA, USDA and Construction Loans. We know it's difficult to save a huge down payment. Now, thru Providence Bank's Affordable Housing Loan Program, we are helping more families realize their dream of homeownership by providing down payment assistance to first-time home buyers. Eligible borrowers can receive a $5,000 down payment assistance grant! To find out more information on this exclusive program, or any of our home loan options, please call us at 800.721.4322 and talk to one of our mortgage bankers. Normal credit qualifications and other terms, conditions and restrictions apply. This does not represent an offer to enter into a loan agreement. Loans subject to credit approval. Products, rates and terms subject to change without notice. Certain income restrictions may apply. Subject to availability of funds. Ask for details.